On Saturday 28 May 2016, JA Europe and JA Turkey (Genç Başarı Eğitim Vakfı) launched the Entrepreneurial Skills Pass (ESP) in Turkey. The event took place in Istanbul within the National Trade Fair and the Competition were 85 teams presented their business idea developed during the Company Programme. 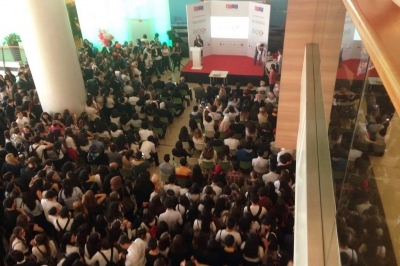 Baris Tezcan, Chairman of JA Turkey, and Secil Celebi, CEO of JA Turkey, officially launched the ESP programme at the presence of 500 people, including representatives from Turkish education authorities, teachers, students and parents. The Entrepreneurial Skills Pass in Turkey is being implemented under the umbrella of the Civil Society Dialogue Programme and co-funded by the European Union and the Republic of Turkey. Following other 21 European countries that are delivering the ESP, from now on Turkish students will have access to the this international qualification process. A pilot will be carried out during this school year (June 2016) with 150 students from 18 different schools. Before the launch of ESP, the National Focus Group (NFG) met for the first time to discuss how to support and disseminate ESP across the country. The NFG is composed by players deeply engaged in the entrepreneurship education ecosystem in Turkey among which representatives from education authorities, business sector and teachers. The lack of entrepreneurship education in Turkey particularly for this age group and the need to strength the cooperation between all organisations involved were also topics covered during the meeting. The NFG members accepted the mission of raising awareness on ESP all over Turkey and they will keep meeting twice a year to discuss potential synergies. The day ended with the announcement of the winners of the National Competition who will represent Turkey in the European Company of the Year Competition (CoYC) that will take place in Lucerne, Switzerland on July 25-28, 2016.